e-pill MedSmart with "Patient Compliance Dashboard™"
Patient Compliance Dashboard keeps the patient 'in the loop'. | MedSmart VIDEO. 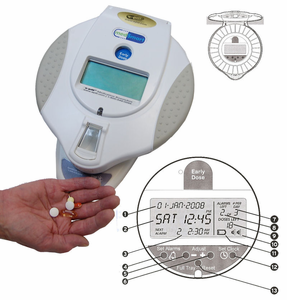 First and only automatic medication dispenser with interactive patient display keeps the patient informed: | All e-pill Automatic Pill Dispensers. D. Battery Status (AC adapter is included and supplies power when your e-pill MedSmart Automatic Medication Pill Dispenser is 'docked'). Batteries (4 X AA) are also used for back-up power in case you experience a power outage. F. Doses Left in active medication tray inside the locked dispenser. Spare medication tray included (can be filled remotely). Each compartment holds 20 aspirin sized tablets. You may purchase additional spare trays. True 28 dose capacity. Set two (2) alarms for the same time to increase tablet capacity. G. Medication Times Left today and Total Medication Doses scheduled for today.